Alizee Froment is the Chef d’Equipe for the French Pony Dressage Team and a very successful Grand Prix rider. Alizée was educated as a rider at the French National Equestrian Centre in Saumur, France. 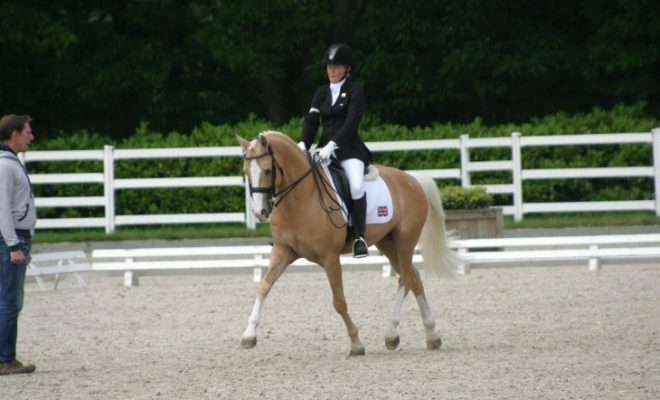 After missing most of the 2012 season due to a severely injured spine and leg, she successfully returned to competing all the way up to CDI****. 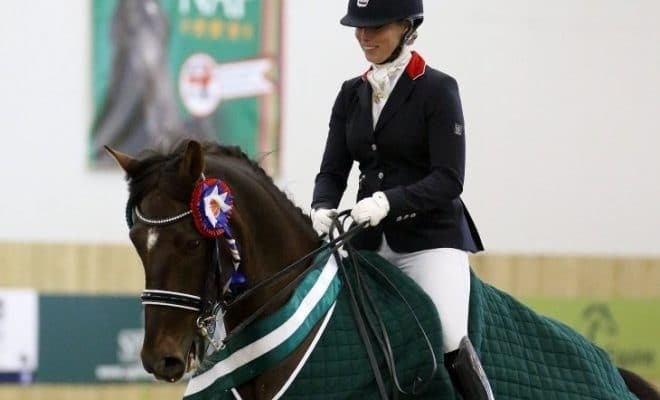 Alizee started riding and training without a bridle as a way of testing and maintaining her connection with her horses, and now rides all of her horses this way regularly, from her five-year-olds right up to her two Grand Prix horses. She travels the world doing incredible freestyle dressage performances with just a neck strap and still competes at Grand Prix in a double bridle. Hi Alizee and thank you so much for joining us. I’m super excited to have you here especially because you do things a little bit different to the normal FEI. I understand that you ride bitless as well, so I’m so excited to have you here. I’m very good, thank you very much. Hello. To start off this interview we like to know something a little bit different about you. Have you got an interesting fact that, possibly, most people listening would not know? It doesn’t have to be horsey related, just maybe something that you would find to be quite weird, interesting or a little bit different. Since I was born, my mum decided that I will do things in a little bit of a different way than everybody, and so, I have done school at home by myself, alone, from ten years old until my final jockey licence when I was 21. I’ve done everything by myself, and that was to let me have the time to do a lot of artistic things and to travel with my parents because they were doing some movies. 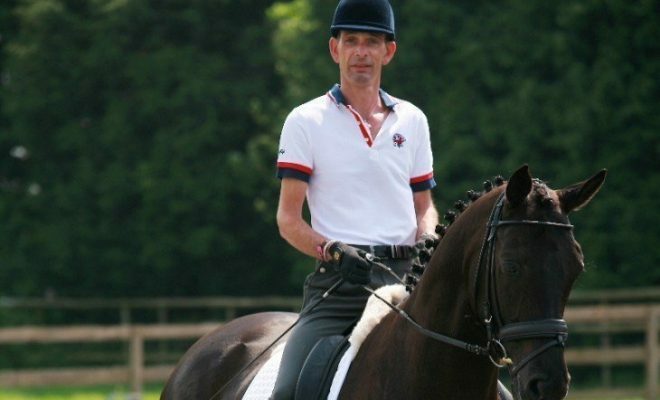 I was then able to make all the international competitions because I was on the French team when I was young, in their pony team and juniors team. I did school by myself, so I had the time to organise myself directly as an eight-year-old. Give us a little insight into your personal life at the moment. I understand you’re in France at the moment, but what does a typical day look like to you? When you wake up in the morning what do you tend to do? How many horses do you have at the moment? Are you married or have any children or any other pets that you have to take care of? What is your normal day to day life like? I don’t have a real usual day because I’m always moving and that’s a little bit my style of life for the moment. I’m based in the south of France. I came back one year and a half ago because I was in the Netherlands before, but I’m always travelling. I’m never at home for more than three days and then I’m again leaving for shows or competitions or clinics so it’s always a really busy schedule when I’m home. I’m always riding the horses during the morning and beginning of the afternoon and then around four I am back home to do all my office work – and I have so much to do. That’s never finishing before eleven in the night. Then I have to do my bicycle for one hour because I was injured two years ago and now I have to do my bicycle for one hour every day. Usually, my day when I’m home, I’m starting at seven and finishing around midnight with a lot of things to do. Then I am always moving. I do not really have a social life, no private life, it’s only horses at the moment. I have so much work and I think it may be the time because I’m young enough to do it, even if sometimes it’s quite difficult, of course, because it’s a lot of sacrifices. That’s it and for the moment I’m happy like this. I have six horses at the stable. I used to have more but since a year and a half ago I am working so much away from home, so I decided to keep only a few horses because I need to be focused on them when I’m home, and when I’m leaving it’s quite difficult. I have some girls that take care of them, of course, but that’s not the same thing. I really want to have time for each of them, so I decided to keep only a few with me. I’m happy like this because. For example, I have Persatuan who I have to work twice a day, one time ridden and one time in-hand work, so you need to have time for each and not be in a hurry. When you’re in a hurry, those are the moments you start to do mistakes with horses, I think. I’m living with my family. I have one brother, we have ten years in between, but we are really, really close. I am his second mother. My mum and my dad, we are all a very, very close family, we do everything together. My mum is coming to the stables all the time just to have an eye on what I’m doing because I’m always working by myself and that’s not so easy, so it’s great when she can come and just tell me ‘you need to have him a little bit higher or deeper, more flexion, less flexion’ and everything. That’s always very important for me. Yes, I bet it’s a real helping hand having your mum there and having somebody on the ground. When we are riding, we obviously can’t see some things that a person on the ground can see. Yes, I have had no trainer for a really long time, not because I don’t want, but because at first I had no money and now it has started to be better, but the problem is that I don’t have time to train. Yes, you sound like you have a very busy life. I thought I was busy, but I think you’ve just topped me. I’m really, really always busy and sometimes when you’re always working alone, that’s hard, and I have no mirror at home so really it’s only my feelings and sometimes just feel is not enough. My mum is really important for me for that. That’s it about my personal life. Of course, I have my little Yupla, it’s my little dog and she is like my shadow. She is everywhere I am and she is an amazing dog. I have a little dog as well and he’s great at times when I need a cuddle or just to have somebody there all the time. My little dog is my life, so I completely agree with you on that. Sometimes having a little dog is better than having a person around. Yes, she is really amazing. You know sometimes when you’re in the rain or something like that and you start to be grumpy, she arrives and she is so funny and then you have a big smile. Yes, absolutely. I’m exactly the same, I can’t stop smiling at my little dog. He always makes me laugh and it just makes the day so much easier. How did you get into horses in the first place? How did you decide that you wanted to start riding bitless, as well? How did all that come about? Well, actually, first I started the dressage late because I started when I was 18, only before I was a jumping rider and I’ve done everything; pony games, Horse Ball, vaulting, I really tried everything when I was young. The average was kind of 13. 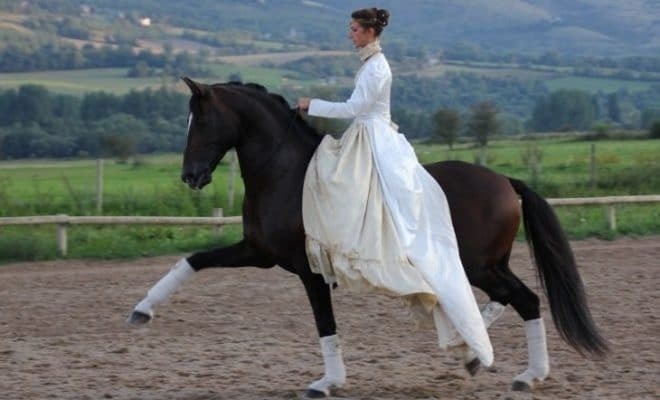 I always have, probably, a little difference in my way of dressage. There are two big changes I had. The first time was with a bitless bridle and then with the rope. The first one was in 2011 and the rope I started in 2014, and both times I was at a hard moment in my career. It was not so easy and I was feeling a little bit sad and not really comfortable. So, I was needing to try something new; to find new things, new feelings and to put myself a little bit in danger. Not because I would fall, but in danger in the sense of discovering something new, and new sensations and all the times, I have to say, that makes me grow so much. At the beginning, it was just the halter and I tried and I felt so many different things. Finally, what was previously just a game started to be something usual in my schedule with my horses, then I’ve done it without the saddle. That was also something new because you can feel all the muscles and all the body moving, which is really something different. You are then building your horses because you can really feel all the back and how the horse is moving in the movement. Then I started to think about the halter, because it was not a good one, so with a friend we started to make some different samples to try to put as less pressure as possible. We have already started with Dutch chain to sell some bitless bridles that are really without any pressure on the neck or the nose. That is the result of four years of research and I am really happy with it. What was finally just a game at the beginning is now something so important for me and in my life and in my career. Of course, I have never done that to become famous or something like that. I didn’t have that in mind and I was a little bit surprised. That was so much to manage in this short time when this happened. Then the rope was a little bit the same. It was a difficult moment and I was a bit lost in Belgium. I put the rope and thought I will try and maybe it will not work, and I had already tried without the saddle. My groom said, ‘you are really definitely, crazy, I think you are going to die today’. I told her that if I’m going to die then please play the camera because maybe it would be a funny video to put, if I die today. I was laughing with her and finally, I’ve done all the exercise, it’s the video that is now free to be seen here. This video is on YouTube. This video was the first time I tried with the rope and that was really crazy because Mistral has done all of the Grand Prix exercise like if it was completely normal between us. When I finished this moment I said, ‘this is what I want to do with my horse’ because any gold medal in the world will never give me this emotion. This emotion is something incredible. When you have your horse with nothing just ready to play with you and to offer everything- I have no real word for it, for my own research, but this was exactly what I was looking for since the seven years I was doing dressage. 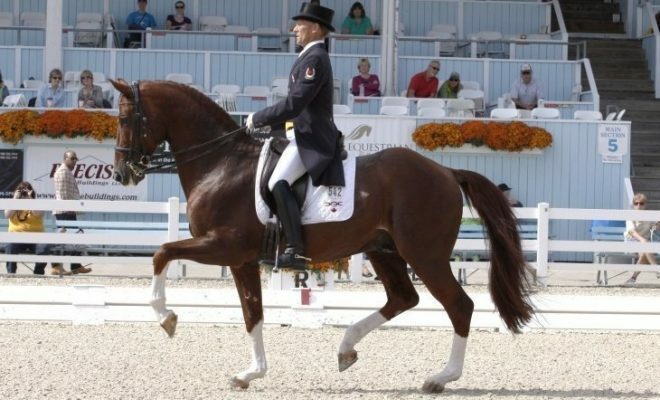 This is dressage for me. Do you prefer to ride now with nothing on your horses? Do you use bits anymore at all? Do you still compete? I’m guessing if you compete you have to wear the tack and the bit and the other stuff. I’m just interested to know, do you just concentrate on the bitless work at the moment? I have all the shows but Mistral, for the moment, he is a bit more focused on the shows with the rope because we have shows all over the world and it’s a bit crazy. We have a completely full schedule so he can’t do everything. In June he was doing TDI 4* of Majorca in Spain and we were doing the show in the meantime. On Friday he was doing the Grand Prix of the four stars, on Saturday he was doing the show with the rope and on Sunday he was ninth in the freestyle of the five stars. He seems to do more than I do. That’s what’s great, to show that it’s not because you are doing the rope work that you can’t do a classical dressage field ring, and the classical dressage is not changing anything. He is even going better because he is really happy and he looks so young and free. I have his son that will compete into the Grand Prix soon I think. If not next year, then it will be the year after. I don’t know, I have to fix some little details. I still don’t know if it will be for the next month or a little bit later, but I am preparing him and maybe a couple of young ones. No, competition is not over but I feel more myself when I am on a team with the rope. I have to say this is really where I feel home. I’m just looking, I’ve got your competition career here and you have done some fantastic things. 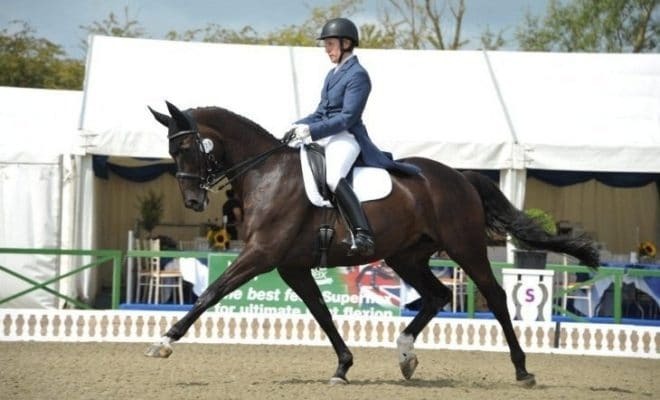 What was the biggest or the highest time of your dressage career where you felt as though you’d made it? As though you had achieved it all and you’ve got to where you wanted to be. Have you ever had that big moment like that in your dressage career? Yes, I lived it actually twice. The first time was in 2012 at the World Championship with Di Magic because it was a special moment in the small final where we won. It was in August and just at the moment they called me a really strong and heavy rain started. We have the pictures and it was looking like it was snowing! There was so much rain and when I did the final of them the rain directly stopped. It was kind of a magical moment, and then we won with 87% so that was something really incredible. You can’t really explain what happened, it was the moment and you have this feeling that you are one with your horse and everything around you is over and it’s kind of a special one. That was the first really beautiful moment that I had. The second one is the TDI with Mistral in the freestyle, it was just a beautiful time, exactly the same feeling you know? This feeling that you are in the right place, the right moment with the right person. On the absolute flip side of that, what have been the times of your career where it’s not been so high? Maybe the low times of your career when things haven’t gone to plan. 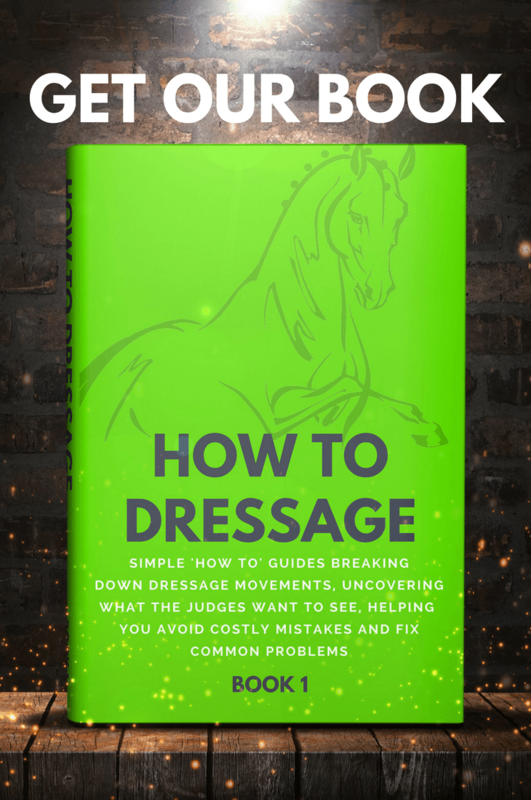 We were talking earlier that horses and dressage and this lifestyle – and it is a lifestyle – it is every day, and they are long days, and they are hard days, and you don’t really get a day off. There are still horses that need working and looking after. Is there any time that you have sat there and thought, ‘I don’t know what I’m doing it for’ and just feel like you weren’t getting anywhere or things were just going terribly wrong for yourself? Are there any moments that you’ve had like that? Yes, I think first I don’t know any rider who is able to say that they’ve never wanted to give up one day. I think we have all this because it is a really hard lifestyle and we have ups and downs. I’ve always been lucky, I have to say, because in all the downs that I had, every time that I left something, or that one horse left me, or something like that, I always had something new coming directly after. I can’t complain, I was really, really lucky about that, but I have been injured. In 2012 just after the World Championship for the second time, I have big problems on both legs because I have three of my muscles broken. I spent seven months at the hospital. When it’s like that it’s, of course, you start thinking that maybe you will not be able to come back. This is a really hard feeling. You are never safe in that kind of life, well yes maybe the ones that have really big sponsors, they can breathe a little bit more, but for all the others, you never know what is coming next tomorrow. You always go to sleep and think I hope that tomorrow everything will be fine and we will have a new project. Even today I have a waiting list for clinics and shows and everything until August 2017, so I am full of work and even like that I continue to feel this little fear say ‘I’m not sure that everything will be fine tomorrow’. You have to handle it or maybe it’s also my personality because I never feel that it’s enough. I always want to do better so maybe it is also coming from me. I discussed with several other riders and for most of them, they are also always a little bit scared because everything can fall down in such a short time. When things have gone wrong, how have you dealt with them? How do you face them and how do you get over it and move on with it? And what advice would give to other people that are maybe going through a difficult time at the moment? I always say you have 48 hours to be down. You can fall for 48 hours, but then you have to enter the fight again. I lost the sponsor or this horse, or I have this problem now. For 48 hours I can complain and then I have to find a new project, a new sponsor or new things to do and I’ve always done that. All the times I had some hard moments and things that fell down, then I always have bigger things coming later, but you have to always be ready for new things and always open for new things. I think when you stay focused too much on what happened and what was wrong and what you lost, then it’s over. We are all human, so we need time, I think, to handle it – 48 hours is a good time, for example. For me, when I have something really hard, and I had it two months ago, I just focused on my horses. I tried to only be with them because, for example, Mistral is an amazing horse for me and so he is my biggest help when I feel bad. That’s a great way of looking at it, and such a positive way as well. To think that just because something went wrong it means that something else good is going to happen. I can totally relate to that idea that you give yourself 48 hours. You need that time; you can’t just brush it off straight away and carry on, because that’s not dealing with it. When we say ‘no it’s fine, everything is okay’ – it’s fake. And you haven’t dealt with the problem, you haven’t dealt with how you feel about it, you haven’t dealt with those feelings. You’ve just suppressed them and then that can later cause more trouble to yourself. Going back to your horses, there are a lot of riders that will be listening to this and they want to experience that feeling that you have felt with your horses. Whether that be under a saddle and bit or whether that be bitless with no saddle, they want to feel that they are able to dance with their horses and a lot of them want to get to Grand Prix. 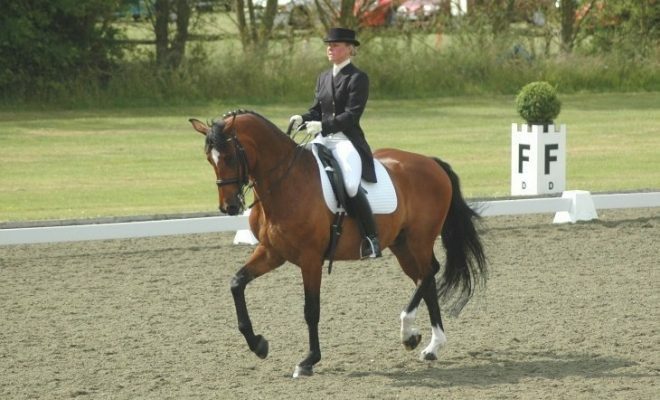 From all your years of expertise, what would you give as your top training tip to any aspiring rider that is training in dressage? What’s the top tip you could give to them when working and training with their horses? I think first I want to say – because so many riders are thinking that because I’m doing this freedom work that I’m not working with a saddle anymore – I’m working my horse with a saddle every day and I don’t think that bits are bad things or wrong things. The way you can use it is good or bad, but then I think, for me, the most important thing – and I learnt it even more last year when I started this hand freedom work in Spain – is that we forget too much the psychology part when we are with horses, but also our own psychology. We have to be the master of our own emotions because they are so important to the horses. I always say, because I have some people that asked me, ‘when are you starting with the bitless? When do you know that your horse is ready to start the bitless work? I have no rules for that. For example, I had Persatuan, he started when he was five. One time and he was great and then I let him grow in his muscles and I started again when he was seven and he was really perfect. But I had a three-year-old, Aslo, who was really incredible. We had a really special connection and already at three, one day I arrived at the stable and I knew that this day was the good one to try him bitless, and he was three years old and he has done everything as if he had a normal snaffle and it was a normal day. I think it was because he had had a rider less than 15 times on his back, so that’s really something coming from inside, but for this, you have to be really open and to control yourself. That is so much more difficult than to teach a horse, because your emotions are the hardest part of the work with horses, and sometimes it’s really hard. You can feel tired, you can feel bad and you can have some problems, and the horses always feel this. Of course, when you have a bit you can hide it better, but when you have a rope and no saddle and nothing, if you are not connected with your horse and you’re not completely relaxed and out of all the problems around, then it’s not working. It can’t work because the horse needs to have a really clear vision when you have nothing to show him the way, and if you are thinking to all the problems you have, or this one that you have to call and the email that you have to write, then it’s over. Just as you were talking I was thinking that there are days when – I don’t have any horses at the moment but when I had two of my own horses – I would finish the day and I would rush down to the stables. I would think that I’ve got so long to ride them and I would tack them up really quickly. I would get on them and ride them and they would always be the worst training sessions ever because I was so flustered and so in a rush. Especially the mare that I had at the time. She used to feel it so much more and she used to get really stressed and really tense about it. I had to learn that when that scenario was there, it was best not for me to ride or to do something else with my horse because it was just never a positive session. Yes, this is really the point. I think it’s so hard because we have all these commitments as well. You’re a very busy person and to stay in that nice frame of mind where you’re completely relaxed and able to spend the time on your horses, without worrying about what the clock is saying, or what’s going on is so difficult. Also, with all the internet and Facebook and everything you have so much with people always criticising and always trying to make trouble. The problem is that when you are riding, you have to do what you feel, and you have to continue whatever happens. Sometimes that’s not so easy, for example, when you’re out somewhere and you feel that you have some people just ready to criticise everything you will do. Yes, we are all humans and we can always do some errors and we are always searching. When you are searching sometimes you make some mistakes and sometimes not, but you have to accept this. I think those kinds of people are not helping in the horse’s world to be better. I think some people do prevent doing stuff with their horses or trying things with their horses because of the opinions of others or because of what other people might say. I think that’s also an interesting point as well. Thank you very much for your time today Alizee, I’ve really enjoyed interviewing you and learning more about your story and your horses. What’s the best way for people to connect with you or follow you or see what you’re up to? Do you have a Facebook or Twitter or website? My website is in construction. but I have a Facebook page and I have a Facebook personal profile. The easiest way is to join me on my personal profile, of course, and then I have also three YouTube channels. One is called MistralAlizee, the other one is AlizeeHorseShow and the last one is just for the horses for sale from the farm of my stallion. They can always reach me and on my YouTube, you will find my email address if they have any questions. I always answer to everybody. Sometimes it can take a few days, but I answer every email. Thank you very much for your time today. I really appreciate you taking part in this interview. I hope you have enjoyed it. Yes, that was a really great moment. Thank you very much. It was a pleasure.